Wayyy back in February of 2014, the state of Marvel movies was very different. Fans were still flush from the afterglow of 2012's The Avengers and had chewed through Iron Man 3 and Thor: The Dark World in 2013. We were looking forward to Phase Two with Captain America: The Winter Soldier that introduced the Winter Soldier and Falcon, and The Guardians of the Galaxy, which begged the question, "which other characters could we look forward to seeing?" 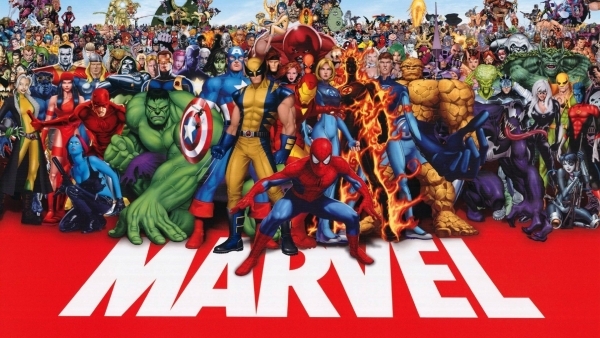 The problem then was that Marvel's movie rights to its characters had been sold off in the 1990s to different companies, leaving their entire comic book universe shattered in a hodgepodge of legal quagmires. 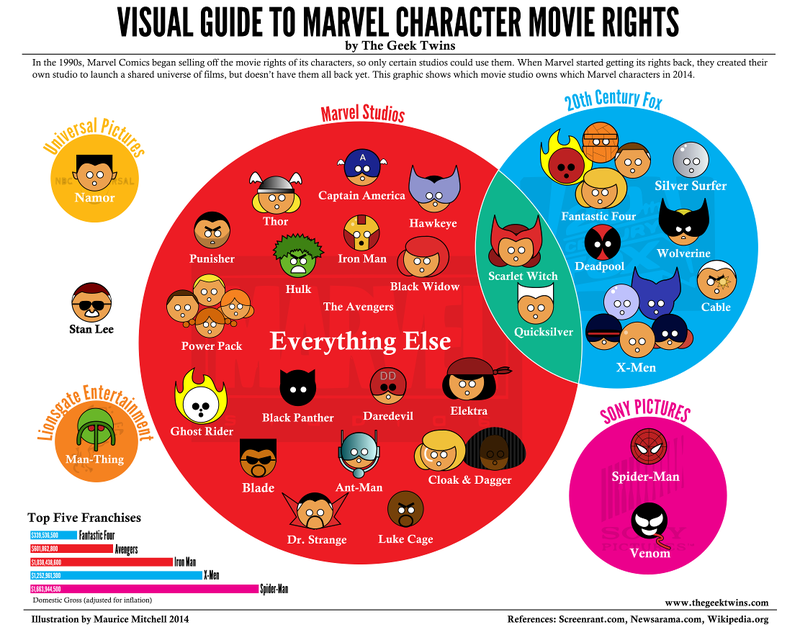 Fox owned the X-Men and Fantastic Four, Marvel Studios owned the Avengers, Quicksilver belonged to Marvel and X-Men, etc. 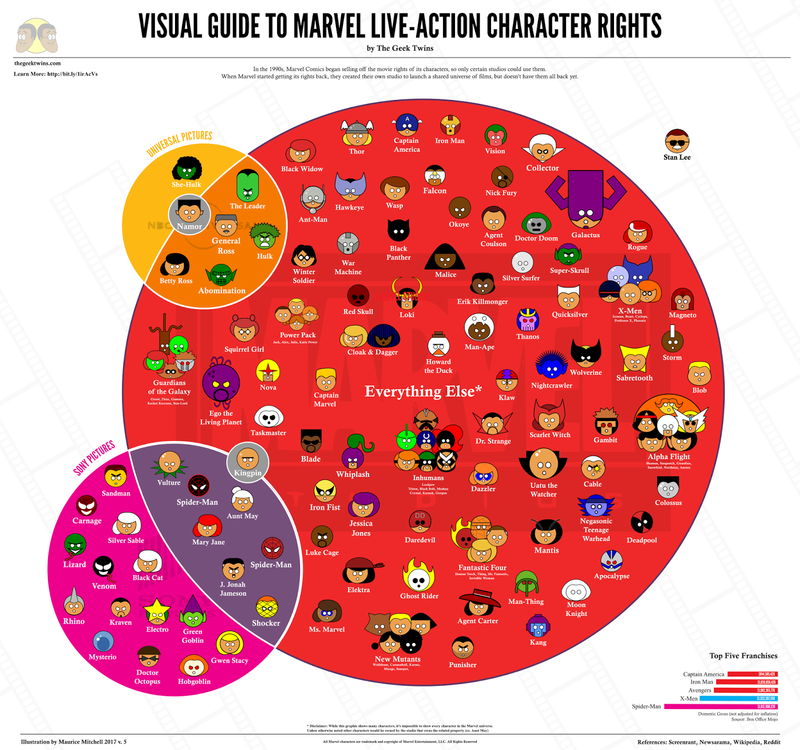 To clear it up, we released the first version of our infographic showing how the different character rights overlapped. Over time, we've updated the infographic as rights have been acquired by Marvel Studios. Well, today the biggest change has come with the announced merger between Disney and Fox, bringing the X-Men, Deadpool, the Fantastic Four and related characters to Marvel Studios. To honor it, here's the original infographic and the new ones. We don't have much more to go before it's all back under one banner. What do you think of the new infographic?